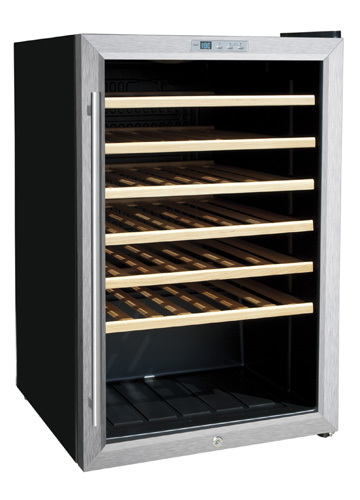 We offer our medium-sized wine fridges, especially recommended for hotels and restaurants, and medium-sized bars. With our medium-sized wine coolers you can guarantee the perfect wine storage to your customers serving it at the right temperature. In this section you will find fridges to store between 33 and 48 bottles of the best wine. During many years of experience in the catering sector, we have identified the most important needs around wine coolers. That is why we make available an average wine size fridge, which adapts to the vast majority of our customers needs. Perfect, not only for catering, but also for individuals, lovers of good wine. Our models of medium size wine fridges, "Midi" and “Magnum” have a compressor that guarantees the proper functioning and temperature of wines, to optimally conserve all its qualities and flavors. Aesthetically, they are elegant with an stainless steel frame, and have a digital thermostat for better temperature control. They include interior light, a lock and removable racks. Wine is becoming more and more fashionable, and in Haimi Group we know how to protect and take care of it, to get the most out of it and offer the pleasure of enjoying wine at their best conditions. 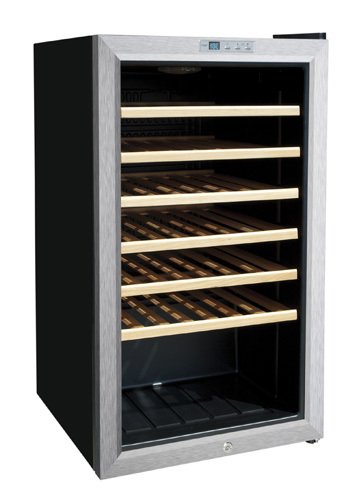 Our medium size wine fridges (for 33 or 48 bottles) are of high quality and do not need hardly maintenance. Get in touch with us and tell us your idea, and which are your business needs. We have been for more than 25 years giving solutions to the Horeca channel. In addition, you can give a unique and personal design to your wine fridge by adding your customized (vinyl or silkscreen) logo to it. Contact us to receive advice so you can decide what is best for you.